With a grater, remove the zest of the citrus fruit. Mix the grated zest and coriander with the salt and sugar in a non-reactive dish, like Pyrex. The more snugly it all fits in the dish with the salmon, the better. In a hot, dry pan toast the white peppercorns, until they exude their aroma, about 3 minutes. Put them on the counter or a cutting board, and using another heavy bottomed pan crush the toasted peppercorns. You could also use a mortar and pestle. Then add the cracked peppercorns to the salt mixture. Thoroughly mix all of these ingredients then bury the salmon in this sandy mixture. Cover the dish in plastic, place a weight on top, and store in the refrigerator for 24 hours to cure. Check the firmness of the fish by pushing aside the salt pressing it with your finger. It should indent only slightly. It will likely need an additional 24 hours but if it feels quite stiff then remove it from the salt. 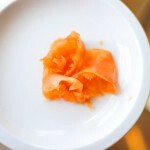 After about two days, remove the salmon from cure, rinse with water and pat dry. You can slice it thinly and eat it this way, or let it sit in the refrigerator for 24 hours on a rack so the surface becomes tacky, and will absorb the smoke more readily. Then cold smoke it for 20 minutes.